These are just a few Records of Service of the many Police Officers who served in the Buckinghamshire Constabulary. Date Appointed. 24th March 1890. Date of Discharge. 7th May 1917. Appointed 3rd Class Constable around 24th March 1890. 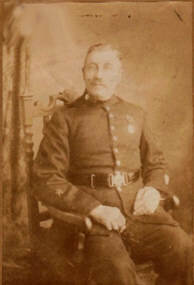 Promoted to 2nd Class Constable 1st April 1891. Promoted to 1st Class Constable 25th February 1895. Promoted to Merit Class Constable 1st March 1897. Credited with 25/8 from the 6th March 1899. Credited with 28/6 from 3rd March 1902. Posted to Hambleden (South Western Division) 16th October1900. William Williams was born on the 21st or 29th March 1862 at Westbury, near Buckingham. He married on the 2nd June 1887. 5 feet 10 ¾ inches tall with grey eyes and grey hair, his complexion was described as fresh. His certificate of conduct was marked "Exemplary". Police Constable 112 William C. Williams is severely reprimanded for not having arrested at Hambelden, on the 29th August last, a man who was dressed in the uniform of the 11th Hussars with whom he had been speaking, and of whom he had just received information that he was wanted on a charge of fraud. This Constables length of service and experience should have enabled him to have shewn more ability in acting. Awarded the George V Coronation Medal. Chief Constables Office, Aylesbury, 11th April 1916 At a meeting of the Standing Joint Committee, held today, Police Constable 112, William Williams, was guaranteed a pension of £53.18.4. to take effect on the date of his retirement. sd/ Otway Mayne Major, Chief Constable.Chief Constables Office, Aylesbury, 24th April 1917. Police ( Emergency Provisions Act ) 1915. Police Constable 112 William Williams, who was granted a Pension of £53.18.4, under the Police (Superannuation) Act 1906, by the Standing Joint Committee on the 11thApril 1916 is allowed to resign and will be paid up to the 6thMay inclusive. On retirement, William Williams became Church Warden at St. Michael's, Steeple Claydon (10 years). He died on the 20th August 1935 at his home at North End, Steeple Claydon and buried in St. Michael's church yard. He was 73 years old and left a widow, two sons - Cecil, Charles and a daughter Eda. His son Alfred died in 1920. Date Appointed. 20th April 1925. Credited with pay of 80/- per week from 20th April 1930. Credited with pay of 82/- per week from 20th April 1931. Credited with pay of 84/- per week from 20th April 1932. Credited with pay of 86/- per week from 20th April 1933. Promoted to Sergeant on probation 2nd May 1933. Credited with pay of 105/- per week from 2nd May 1935. Credited with pay of 110/- per week from 2nd May 1937. Credited with pay of 112/6 per week from 2nd May 1938. Appointed Temporary Inspector from 23rd November 1942. Credited with pay of £335 per annum from 23rd November 1943. Credited with pay of £345 per annum from 23rd November 1944. Promoted to Chief Inspector around June 1947. Posted to The Lee Great Missenden 1929. Posted to Aston Abbotts Aylesbury 1930. Posted to Bletchley May 1933. Posted to Newport Pagnell November 1942. Posted to Aylesbury around June 1947. Joseph Jones lived at a police house in Buckingham Road Aylesbury during his posting there. He died in 1962. Joseph was the eldest in a family of ten his younger brother was PC Philip Jones 24th October 1930. Sergeant John Tobin and Pcs 129 Bush and 77 Jones are commended for their good police work in a case of sheep stealing at Buckland. At Northampton Assizes on the 21st instant, the thief was sentenced to 4 months Hard Labour and Mt. Justice McKennen commented on the able manner in which the police concerned had conducted the enquiry. Signed T.R.P. Warren Colonel, Chief Constable. 14th May 1932. Police Constable 77 Jones has passed the recent qualifying examination for promotion to the rank of Sergeant. Sergeant J.Jones has passed an examination in Anti-Gas measures at Bletchley on the 16th instant. Date Appointed. 24th February 1947. Date of Discharge. 24th February 1972. Promoted to Sergeant 20th September 1954. Posted to Headquarters 24th February 1947. Posted to Iver 21st May 1947. Posted to Bletchley 18th May 1948. Posted to Headquarters, Aylesbury 20th September 1954. Posted to Aylesbury 3rd December 1956 (10 Winterton Drive). Posted to Aylesbury (Traffic) 1st January 1958 (10 Winterton Drive). Cyril Wise was born on the 21st March 1920. Examined for sergeant 1952. Qualified 1952. Date Appointed. 18th May 1959. Date of Discharge. 3rd September 1989. 18/5/1959 - £510 per annum. 18/5/1962 - £730 per annum. Posted to Bletchley Fenny Stratford 5th December 1966. Attached to the Crime Squad at Luton 1969. PC Len Woodley spent three years as a Police Cadet prior to joining the Force as a full time officer on the 18th May 1959. He had an interest in the Bucks Constabulary and wrote several books one being 'Murder in Buckinghamshire'. Description: 6 feet 1 ½ inches tall, fresh complexion, blue eyes, auburn hair. Born: 12th May 1940 at Slough, Bucks. Address: 9 Foxborough Farm, Langley, Bucks. Probationers Intermediate Continuation Course No.118 - Eynsham 15/1/60 to 6/2/1960. Probationers Final No. 560 - Eynsham 16/1/1961 to 28/1/1961. CID Junior Course - Wakefield 19/7/1965 to 25/9/1965. Fingerprint Searchers Course - Headquarters 6/2/1967 to 11/2/1967. 10/5/1963. PC 560 Woodley and PC 616 O'Neill, Aylesbury, are commended for good police work at Aylesbury on the 8/4/1963 resulting in the arrest of Andrew Bird CRO 13032/63 for larceny of a car in the M.P.D. and when offences for which he was sentenced to 6 months and 3 months concurrent and 3 months. This arrest resulted from the examination of a suspicious vehicle excise licence followed by persistent enquiries and when Bird was dealt with at Ealing Magistrates Court on 16/4/1963 the two Bucks officer was commended by the Bench.